This rug is great! It is a very low pile, almost flat weave. It is perfect under our dining table. 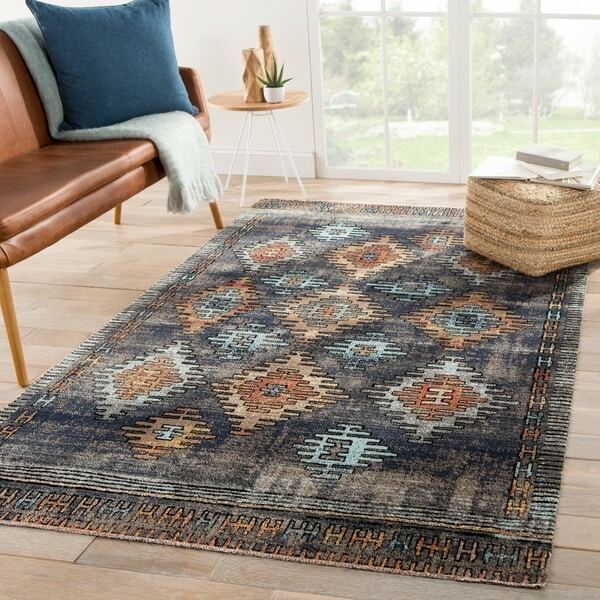 The colors are gray, blue, rust, gold and brown... while there is lots of color, it is a good neutral rug for our decor. A global statement with contemporary pops of color, this fun indoor-outdoor area rug captures attention with a tribal Southwestern pattern. This weather-resistant rug features a lightweight yet durable polypropylene construction, ideal for high-traffic and lived-in spaces. The blue, yellow, and orange design boasts a distressed effect for a vintage-inspired look. Dimensions 96.0 In. X 30.0 In. X 0.2 In. Looks just like photos. It is a very thin rug but comfortable with a thick pad. Lies flat, doesn't shed. If you look carefully at the photos and think it will fit your needs, then you'll love this. The look is exactly what I was going for, and the colors are just as they appeared on my screen, so I'm pleased. Is this a lush, high-quality rug? No, but if you look at the images available, that won't be what you're expecting. I'd buy it again as the look is just what I wanted. Rug is just as ordered. Looks great in my living room. I only wish it was a little thicker.